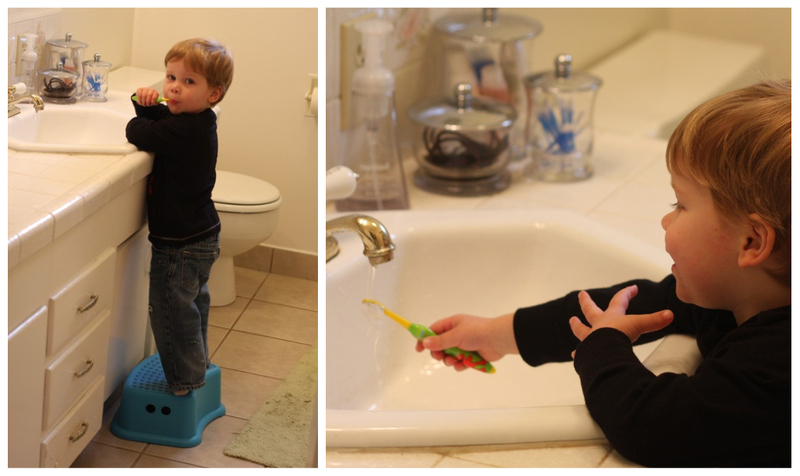 The other day Connor brought his stool in the bathroom and brushed his teeth like a big boy. When I was looking at the pictures I took of him doing this, I was struck by how grown up he looks. He isn't my baby anymore. And then I realized...I don't even remember the last time he fell asleep in my arms. It made my heart kind of sad. Sad that my little boy is growing up more and more every day. But at the same time, he is so dang cute. I can't stay sad for long because every time I look at that adorable face, I smile. Since Isla was born, I have let her do her own thing as far as sleep goes. That means, she has pretty much always fallen asleep in our arms. Last night I decided to put her in her crib and see what would happen (she has been sleeping in bed with us). Low and behold, she went to sleep on her own, without crying. I was so proud of her. Then I realized, I was sad over one of my babies no longer sleeping in my arms, yet happy because the other one actually went to sleep somewhere else besides my arms. Oh the irony!